All of our phone systems have effective voice messaging solutions to manage calls when you are already on a call, in a meeting or away from the office. Solutions range from the standard individual voicemail box to anywhere, anytime access to messages with an integrated, fully-featured voice mail system, Unified Messaging and an automated attendant. Our Mitel Unified Messaging enables users to be notified of new voicemail messages wherever they are with an email that contains a .wav file of the callers voice message. 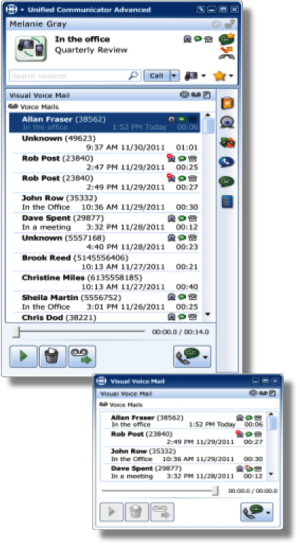 Our Mitel Unified Communicator Advanced application provides Visual Voicemail within an on-screen client where the user can see the date, time, number and name (if stored in their directory) as well as play messages on screen.